The WannaBeatles are four guys, trying to do what sometimes seems impossible. As has been pointed out, the Beatles grew from being a rock band doing their own songs into a studio band that did amazing songs that no one could ever reproduce live. That is, until we came along. Well, actually other musicians have taken up the challenge long before us, and done a great job with it. But the point is that what the Beatles did in the late sixties couldn't be performed onstage until certain technology emerged to make it possible to reproduce some of those sounds. So we're using what can to make it happen. The latest of these challenges is a song Dennis suggested. Knowing we were headed to Virginia Beach later this year for a concert with a symphony orchestra, he said we should work up "I Am The Walrus." 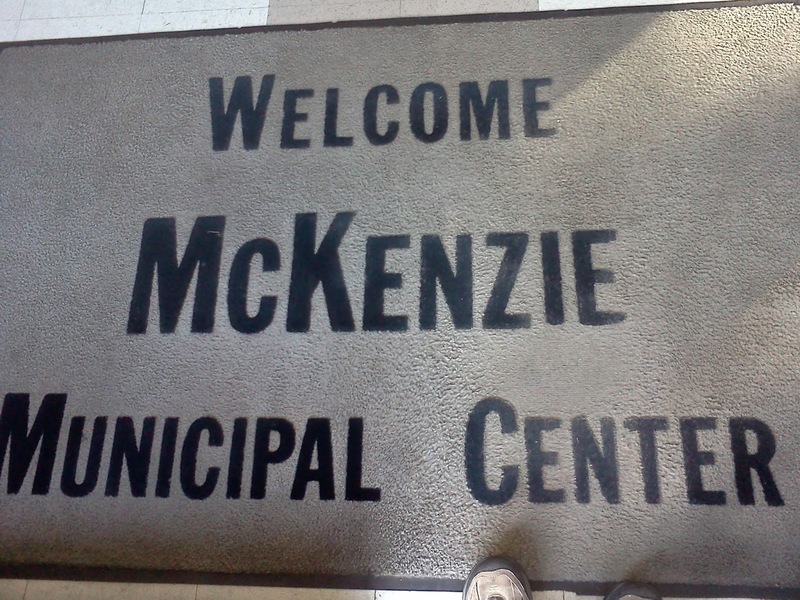 McKenzie has a lovely town square, with a gazebo, lots of shade trees and park benches. The gazebo reminded us of Nathan's home town, which he described in his song "Bristol Lights" as having "a band playing Sousa on the bandstand on the green." 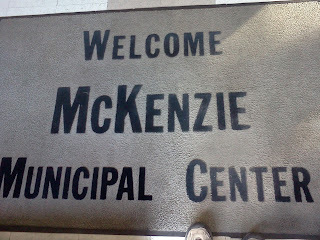 Here's the friendly welcome mat at the city hall building, where we had a nice air-conditioned room for changing clothes. And here's a view of the new city hall building, decorated for their Freedom Fest. This building was the scene of the famous moment of discovery when we were getting dressed and I noticed that my pants were missing. That led to an unforgettable trip to the shopping district of McKenzie, where I found a pair of black jeans in my size for 14.99 at Fred's, and managed to buy them, put them on, and return to the stage in less than twenty minutes. And now, back to the less exciting story of how we try to learn "I Am The Walrus." This is one of the weirdest Beatles songs. It's very unorthodox, and virtually nonsensical. But Lennon's wacky lyrics are supported by a very creative musical track, made energetic and mysterious by George Martin's orchestrations, involving strings and horns playing some memorable lines. We had to listen and think about how to recreate the parts. We're accustomed to being innovative, having explored possibilities like David playing a keyboard with his left hand while playing the drums, and Nathan playing three or four different parts by dividing his keyboard into sections that play different instruments, sometimes even programming different pitches to accommodate the peculiar notes of a specific phrase. In this particular case, we found that Dennis playing bass and singing lead would liberate the greatest amount of other musical resources to cover the complex requirements of the song. Nathan became our reliable research department, scouring the available tracks from youtube to transcribe all the horns and strings, writing them out with numbered measures so we could rehearse the different sections. David is playing horns on the keyboard with his left hand, while playing drums with his feet and right hand. I'm playing some guitar, but mostly cornet for other horn parts. Here's the chart Nathan made, to which I added some extra instructions for vocal parts. Nathan is covering the electric piano and strings, and other sound effects. David has invested in a special attachment for his drumstick that creates the sound of a steady tamborine while he plays. It's not everything, but it's a lot. And one day, later this summer, we will hear the entire song with a symphony orchestra. That will be the satisfying result of all this work. But if you can't be there, I hope you hear us do it as a four piece group. If you do show up for our version of "Walrus," I hope you join in by singing along. Once we get it ready. There's still work to do. We've made a new album, and we're proud of it, and people are starting to buy it. But it doesn't just happen unless we also make an effort to play the songs when we get the chance. That means learning the songs. Which is not as easy as it sounds. 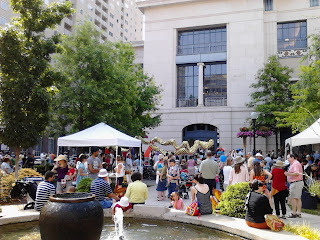 But before launching in with a reflection on the nature of musical performance, I'd like to offer a more fun part of the blog: the photos from yesterday's Puppet Festival. Proceed to the end of the blog, enjoy yourself, and then return here if you have the time and feel so inclined. We like the songs. We wrote the songs. We produced them. We labored over them, spending hours deciding and recording the parts that would best enhance them, from guitars and bass and drums, through vocal harmonies, and going so far as to add horns, percussion, strings, and extra singers. We love the songs, as we should, since they only exist because of our efforts. But playing them live is a very different challenge. And that points out the complexity of being a band - how the simple joy of playing music together becomes a business, made both more powerful and more daunting through technology - which, in turn, gives us access to thousands of people while simultaneously removing us from the simple foundation of playing songs together. And although we are in a very different situation from the Beatles, there's a strong connection here to their experience: the fact that they stopped performing as a live band and continued their music making by concentrating on studio recording. Their later songs, like "Eleanor Rigby," "I Am The Walrus," "She's Leaving Home," were never intended to be performed on stage. They were assembled as ideas, created, arranged and produced as a band with their producer and engineers, then released as records, which - because of their momentum as the most popular band in the world - continued to sell. Their popularity was the problem that made live performing impossible, or at least too difficult for them to continue. But it was also the factor that made their retreat to the studio a viable business model. For us, the massive popularity is not a problem. 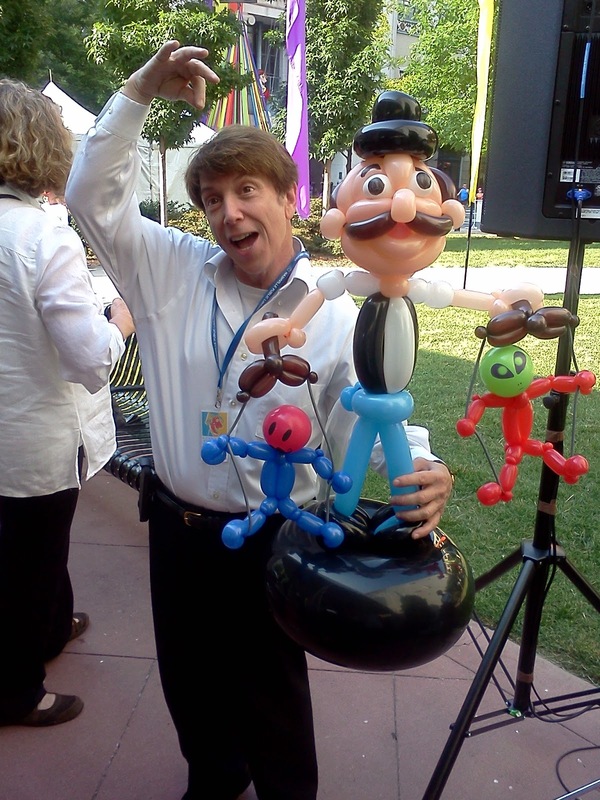 We perform, and we enjoy it, and our audiences enjoy it. We also enjoy writing and producing our own songs. But the technology that allows us to build the songs by adding layers of sound also allows us to make an album of songs that we've never actually played as a band. With the exception of "Oh Betty!" and one earlier version of "This Song's For You," we've never actually played these new songs as a band, all together in one room (or on stage). The difference is major. One might even think that by making an album of original songs we haven't played as a band we've deluded ourselves, and our audiences. No, we're making songs the way people have been making songs for over 40 years, using multi-track technology to add musical layers that sound good. But, as we've learned from exploring the later Beatles songs they never performed live, like "Magical Mystery Tour," it takes a lot of thinking to figure out how four guys can make all those sounds on stage. We can't do it all. But we do what we can. We can sing at least four parts, and we can play a bunch of instruments, sometimes more than one at a time. Case in point: "In '63." Among the more elaborate parts of the song are the strings, which Nathan arranged. He's capable of playing those parts on his keyboard, while also playing the bass part, and at least some of the piano part, (the song was originally written on piano, so that's an important part) and singing a harmony part. Dennis sings lead, and plays guitar, although his guitar also has a MIDI sound generator, so he may play some strings too. I play guitar, and sing harmony. David plays drums and sings harmony - although there may be some extra percussion or sounds or keyboard parts coming from the gear he keeps set up around him during our shows. It was Nathan who suggested that we learn the song in time for our Crockett Park show, in order to play it as a way to let people know we had a new album out, which would be available to buy at the concert. The problem for us was getting together to rehearse. 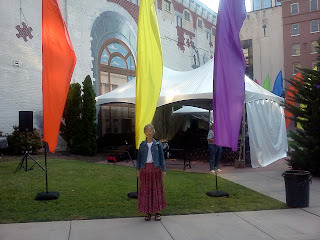 The week before the Crockett Park concert, I was in Georgia visiting family, so I was unavailable. But again, technology was there to solve our problem. Skype - a way for me to be 200 miles away and connected via a computer screen to the other three guys rehearsing the song. I discovered that in the mountains of north Georgia, there was no internet service, and no cell phone coverage. However, I did have access to a land line telephone - one of those plastic things with a cord connected to the wall - which meant I could talk to Dennis and David and Nathan while they were rehearsing the song, and I could hear the parts I would be singing. Here it is, the day of the concert, and we still haven't played the song together as a band. We hope we'll have extra time at the sound check today to go over it, so that we can at least launch into its maiden voyage with a bit more confidence than fear. There's no substitute for practice. And practicing as an individual, although necessary, is not the same thing as practicing as a group. We're considering a high wire act here. We hope you appreciate the risk we take. Once we learn the song and learn how to play it well, we know you'll like it. At this point, we are depending on your good will - trying to imagine how good it would sound if we knew how to play it. That's asking a lot, and we know it. Don't think we don't appreciate it. 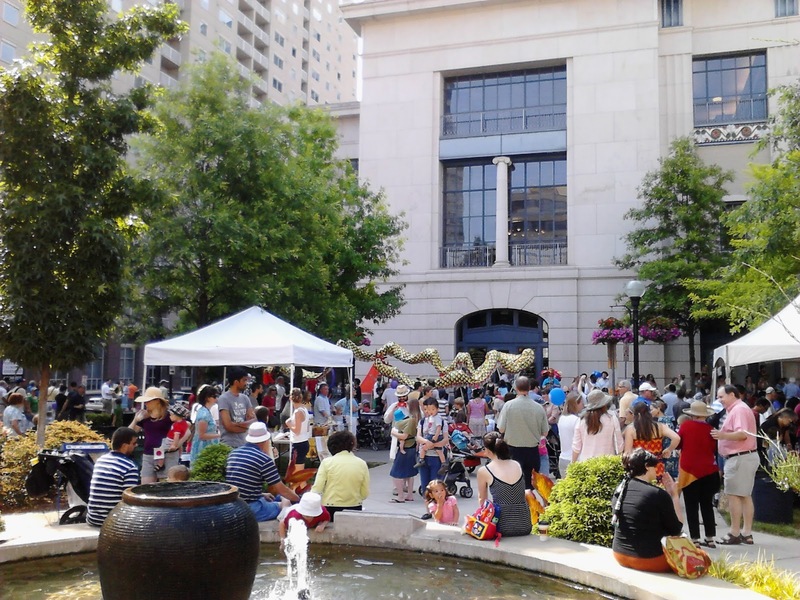 Meanwhile, we had a great show yesterday downtown at the International Puppet Festival. 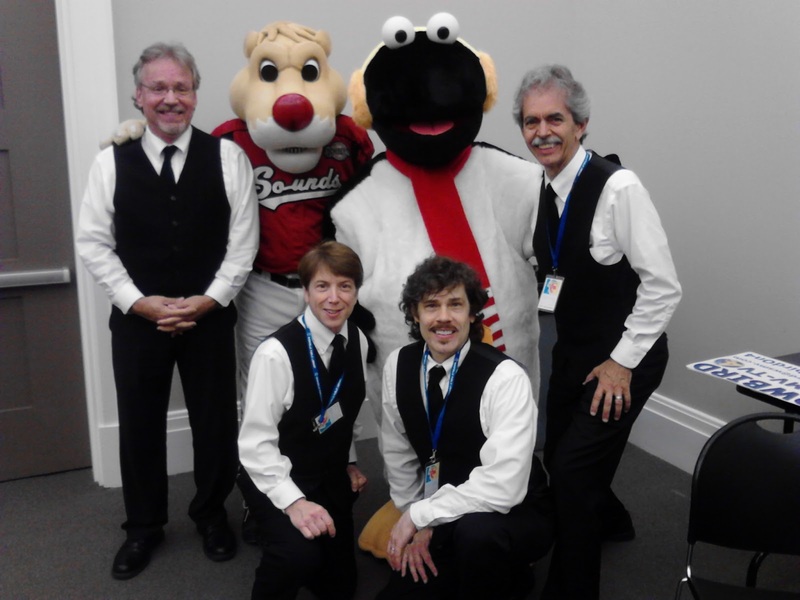 We got to meet Snowbird and Ozzie, the Nashville Sounds mascot back in the dressing room, in the LIbrary. We had lots of kids on stage with us, dancing and blowing bubbles. We played "Oh Betty!" and sold some CDs. The adventure continues. who has his own balloon puppets. 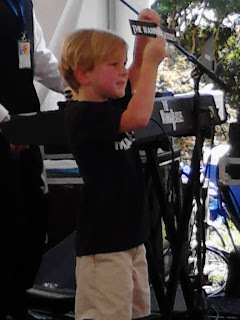 Graham, five and a half, who knew the words to every song, got onstage with us, and brandished a bumper sticker. We had fun! Hope it shows. 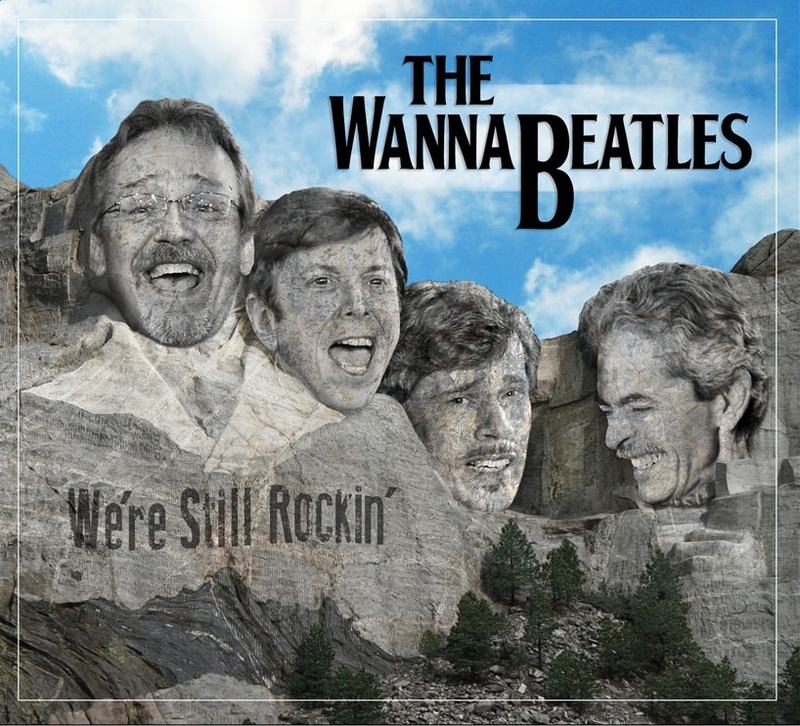 It's been a busy week in WannaBeatle World. Thursday was our rehearsal, but we also spent hours installing the software that would allow people to listen to, order, and pay for the album from our website. Hey, we're a business now, and this is part of what we do. 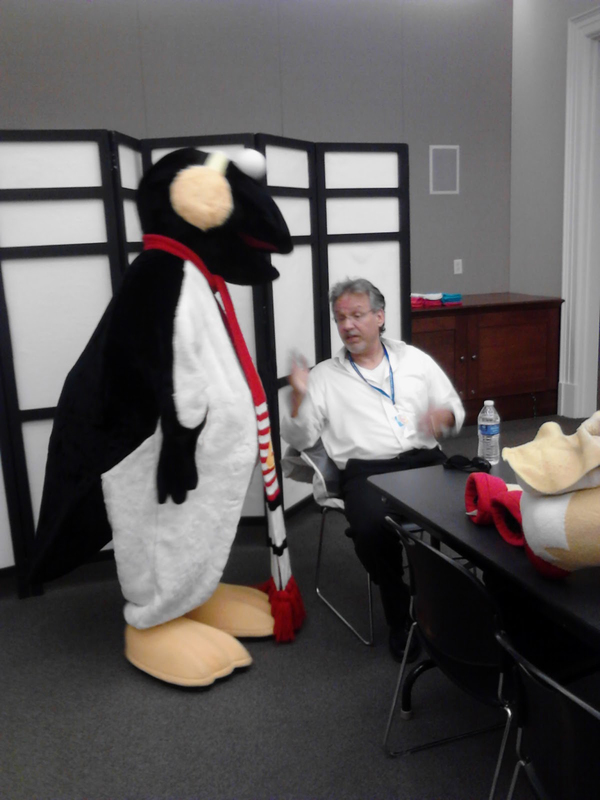 Fortunately David has an appetite for engaging technology, and Dennis can see the value of what we need, so they make a good team talking to tech support as we wade through the details. 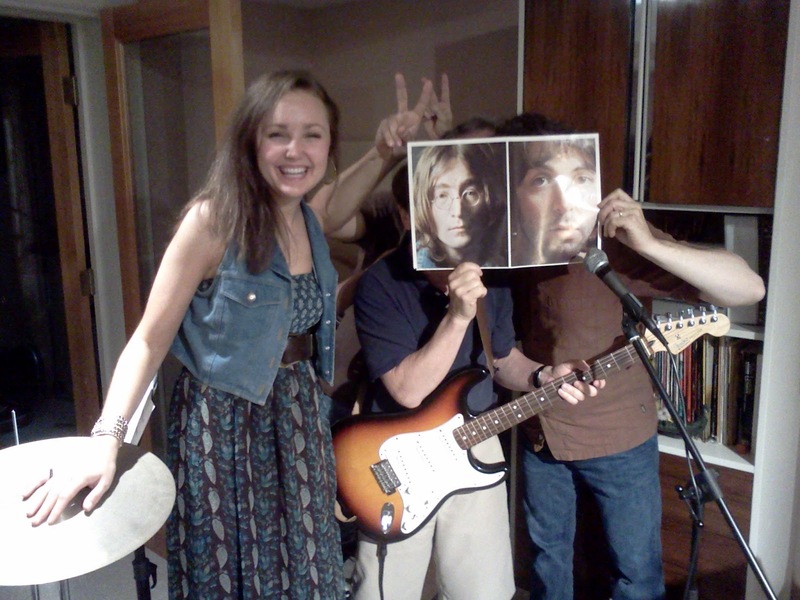 Friday we had a live radio appearance on Hippie Radio 94.5. That was our first chance to hear any of our new songs on the radio, which is a special thrill. Our host was DJ Chris Lucky. We sang acoustic versions of "We're Still Rockin'" and "Louise," in the control room. Chris also played tracks from our CD, "In '63" and "We're Still Rockin'" while we were there. We noticed something unusual as the second song played: during the whistle solo of "We're Still Rockin'," the CD skipped - it repeated a section, and then started looping, as if it were a vinyl record with the needle stuck. It was a little bit horrifying, to experience a malfunction of our fresh new supply of CDs, on a live radio appearance. We wondered if that meant the entire batch contained an error. It was also exciting, as we watched Chris calmly fade from the weird repeating section to a station ID, and we joked about the psychedelic nature of the record, as if we had intended such an artsy effect. 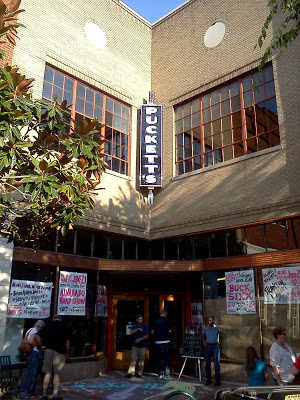 Friday night we played at the new Puckett's restaurant in Columbia. Since we've played regularly at the Franklin Puckett's, we'd heard about the newest addition to the family, but not seen it before. It's beautiful. 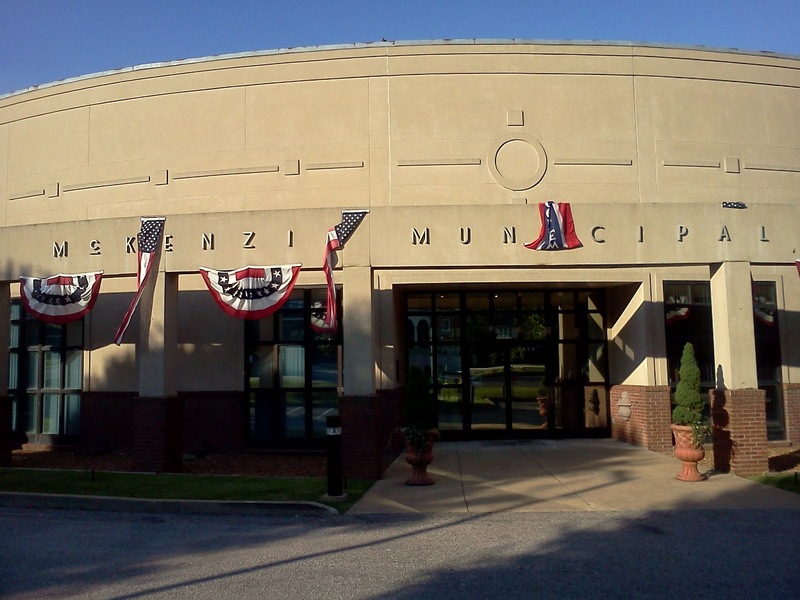 It's located right on the town square, alongside other businesses nestled together facing the county courthouse. It makes for a very attractive center of town. If you look close, you'll notice their new sign combines a guitar headstock with a fork at the other end, making the statement that food and music are equally important. That seems like a good summary of the Puckett's philosophy. 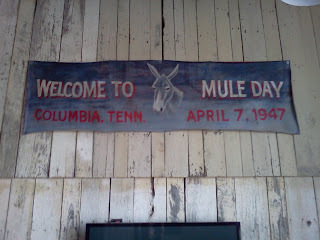 There are lots of posters and antique signs to contribute to the atmosphere. 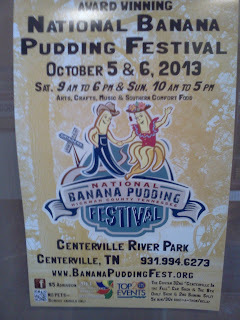 Here's one that's probably unique to certain Southern towns. 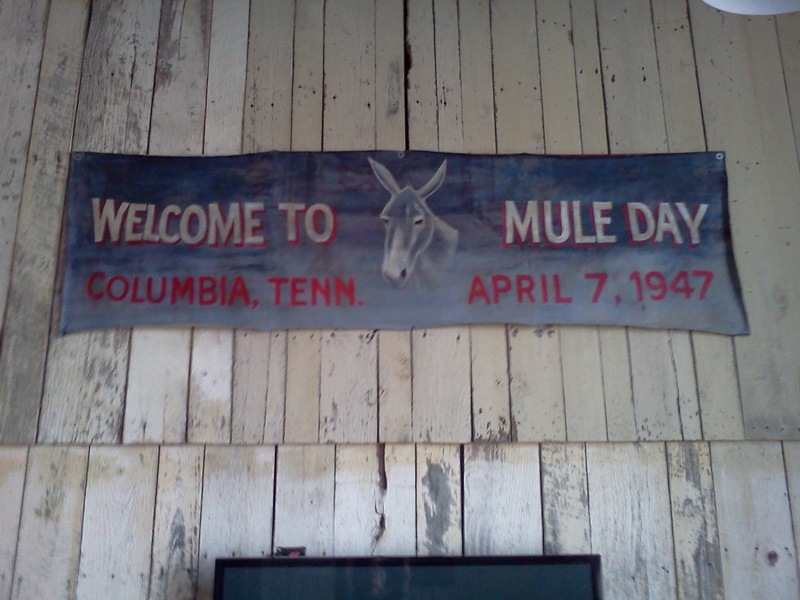 Among the decorations are reminders of Columbia's unique history as the home of Mule Days. 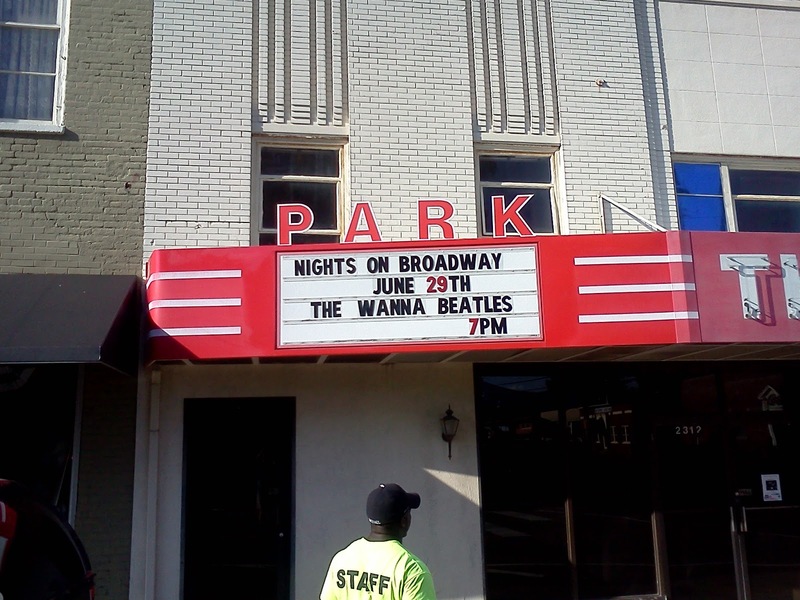 Here's a banner that's even older than all of the WannaBeatles. This new Puckett's is twice the size of the one in Franklin, and very charming. We heard we'd sold out, with 180 seats all occupied. Our crowd was very enthusiastic, and asked for two and a half encores. They bought a bunch of copies of our new CD, and we put our autographs on a few of them. It's an exciting stage for us, putting our signatures on pictures that only a few weeks ago were an idea that we were sending to a graphic artist in Las Vegas, as he put together our Mt. Rushmore cover. And the songs have already been on the air! And you can buy the album at our website! 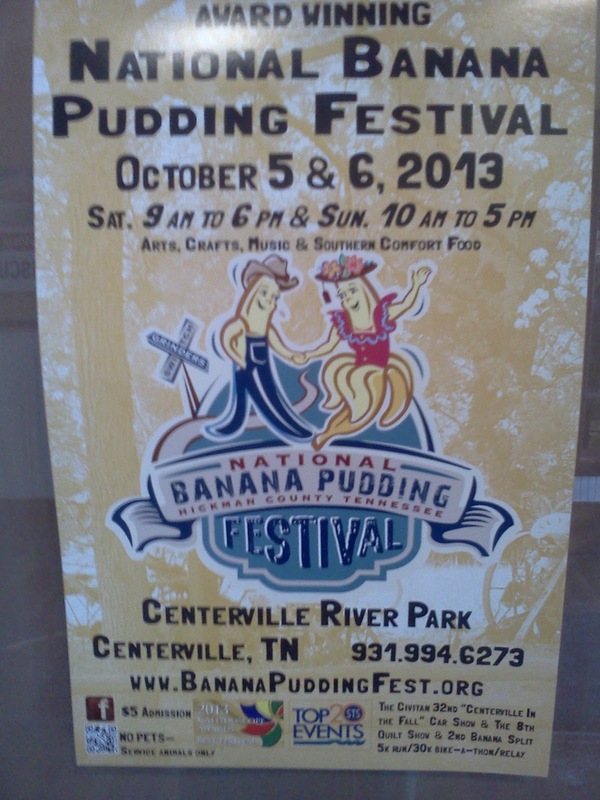 We'd be very happy to see you there. And of course, we hope hearing the music makes you happy. That would be the best of all worlds. Yesterday we rehearsed with Rachel Hale, who has been on American Idol. We watched her TV performance on youtube. 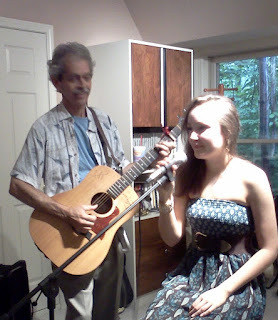 She did a great bluesy number, then received compliments from judges like Keith Urban and Mariah Carey. She's our special guest for the upcoming show at Crockett Park on June 23. She's doing three songs with us: "Get Back" (Tina Turner style), "Blackbird," and a rocking' version of "I Saw Him Standing There," based on Maggie Bell's rendition from the soundtrack to "Across The Universe," the 2007 film based on Beatles songs. She really rocks. As soon as she opened her mouth, we felt a jolt of energy. We knew we had something - a playing situation that would keep us on our toes. "Get Back," for example, sounds a lot different the way Tina Turner does it, even though it's basically the same tempo and same key as the Beatles. As Nathan said as we launched into it, "more like Rolling Stones than Beatles." Bryan and Rachel rehearsing "Blackbird"
"I Saw Him Standing There" is very different from the Beatles song. It starts with a bluesy guitar licks, uses strong rhythmic accents, and features lots of gospel-flavored piano. We're really looking forward to performing with her at Crockett on June 23. On a different topic, we received a nice signed photo from Betty White, after letting her manager know about our song and video "Oh Betty! (The Betty White Song)." 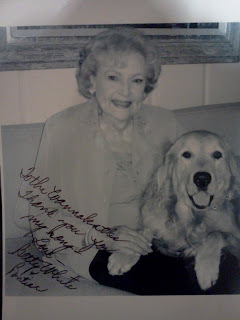 She sent us a photo of her with her very nice dog, whose name is, apparently, Pontiac. Life is never dull with the WannaBeatles. Come to Crockett Park on June 23, enjoy a picnic on the lawn, see our new album, and hear Rachel Hale, all for free. Hallelujah, we're close to the finish line. We had one full day of checking all the mixes. Gary had already spent several days giving the songs his full attention, but this was our chance to give the songs any extra tweaks. This was Tuesday, starting at 9:00 am. Dennis was in Florida, but he gave us access to his studio all day. He stayed in touch with his cell phone and computer, checking out mixes over the phone, and making sure we were on schedule. We had to finish the mixes that night, because Gary was already booked the next day for another project, and the final mixes were due to be delivered to the mastering studio, which is Doug Wayne of Mastermind. And it took all day to listen to every song and give it the attention it deserves. We spent almost three hours on the first one, "Let's Run Away," adding some cinematic touches - like the sounds of ocean waves on the shore, mixed with rain forest bird calls. What a way to start an album. We caught our stride and spent much less time on succeeding mixes. Nathan went out to grab us some sandwiches for lunch while we stayed at it. We didn't finish till 9:30 pm. And then Nathan drove over to Doug's studio to deliver the final mixes. 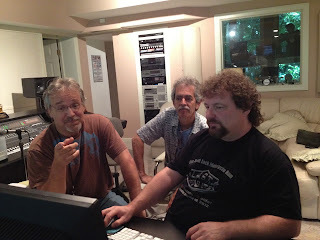 Here are some photos Nathan took of Gary, David and me in the studio. You can tell it was a nice day. You may also see again why we feel blessed to be working with Dennis. You'll notice David sits up close, beside Gary. David seems to take the greatest interest in the technical aspects of the process. Looking back over the years that have led up to this moment, it seems that David has been the main cheerleader for moving us ahead. He's the one who pointed out that doing our own songs was, in fact, a way of honoring the Beatles, and what they accomplished. He's the one who has pushed me to play better guitar solos and try out new ideas. And for those who may be curious, David - our drummer, and best singer, already playing bass and keyboard on several songs - also played some guitar on this CD. You can hear his cool sonic additions on the verses of "Let's Run Away." And listening to these mixes makes me realize that my own musical contributions are better because of the interaction with the other members of the group, especially with David. In a way, he's a "guitar producer," encouraging sounds, parts, and energy that I would never come up with on my own. David points, Bryan listens, and Gary handles the mouse. Doug Wayne finished the mastering within a few hours the next morning. He made a reference CD for us to check out. Nathan suggested we meet at my house to listen. So David and Nathan both came over here. We were pretty happy with the sound of it. It was good to have a day to rest from the mixing, to come back with fresh ears. But even more, it was a chance to realize that we were listening to a major accomplishment for us - something of a dream come true. We had put a lot of work into it, and now we could hear the results of our work, knowing we had tried our best and used the best people we could find to create a product we could be proud of. As it turned out, Nathan had received the final proofs of the CD cover artwork, and brought that over here on the same day. So we had the elements of our precious baby in hand - the physical cover in full color and the final audio version of the album, all of it ready to be assembled, getting our final approval. Technically, we thought we heard a discrepancy in the bass level on one song. It seemed that the bass on "License to Spy" was not as loud as the bass level on the other songs. We called Doug about that issue, and he said that, yes, he could increase the low frequency portion of that song, but that it's much better for the mastering process to make such changes at the mixing stage. Which would mean going back to Gary, and having him increase the bass on that one song, then taking that remix back to Doug to remaster that one song. Gary was unavailable for several days. Dennis, on the phone from Florida, reminded us of how many days would be lost because of the chain of events that would be required for the delay. Was it worth it? This was the sort of choice we were getting used to: how to meet our self-imposed deadline while still wanting to add or change things we thought could be better. Dennis had already given us the lecture about perfectionism being a deceptive influence - a way to delay things indefinitely. Sometimes you had to accept things the way they are and move ahead. This was one of those things. The problem we heard was not major. It was the sort of thing that might not be noticed at all. It was even the sort of problem that once you "fix" it, you might decide you liked it better before. So we endured the discipline of restraining our impulses in order to accomplish the greater good - or something like that. And we made extra copies of the CD to listen in our cars. And then we got even more excited. Listening to the CD in my car gave me a renewed appreciation for all the energy that went into it. One song in particular really explodes with energy - "We're Still Rockin'." It starts hot and never lets up. It's loaded with vitality. When the chorus arrives, it's a new key altogether, with strong harmony vocals, and then rockin' guitar fills on top of that. It's the song that keeps on giving, just when you thought it couldn't be any more exciting. I had to call up David to thank him for all he put into it, because it seems like the song that really delivers an unmistakeable eruption of energy. We captured something that cannot be denied. Our lives are tethered to an appreciation for how music communicates excitement. We know how records like "Rock Around The Clock," and "Hound Dog" and "I Want to Hold Your Hand" and "She Loves You" excited entire generations around the world. 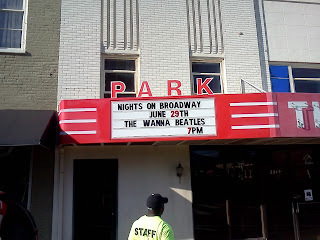 We enjoy performing Beatle songs for people who love them as much as we do. But now, with this album, with this song in particular (it's track number 7 on the CD), we've created a song with a comparable level of energy that will show people that we have something special. It gives us hope, and joy. 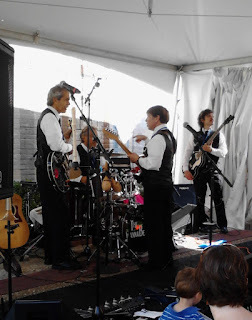 We played a gig last Sunday night, and announced to the audience that we have a new CD coming out. We referred to it as a dream come true, because for us it's been many years of wanting to do something like this. Working together as WannaBeatles, and now releasing an album of our own songs is a way for four guys to do something creative that we were built to do, something that only can happen when everything comes together in just the right way. You'll have a chance to see it and hear it soon enough. It's out of our hands now. We'll have the finished product within three weeks, and we'll have them at our shows, and available online. Of course, when you see us live, we can autograph your copy of the CD, and we're happy to do it. But don't let that stop you from enjoying the music and spreading the word.